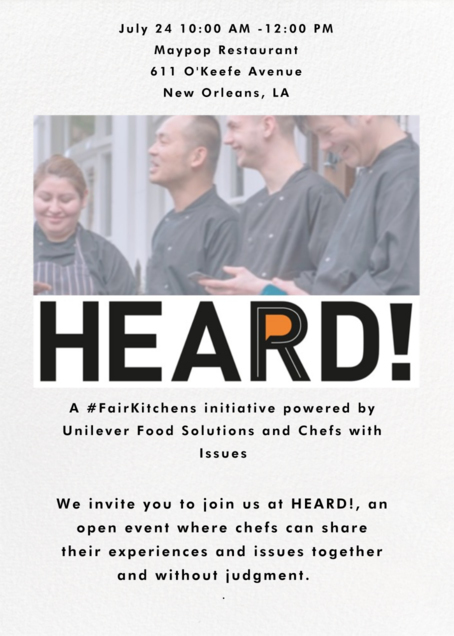 Fine humans of New Orleans, I’ve been working on this with the folks at #FAIRKITCHENS and it would be an honor to have you join Chef Mike Gulotta and me from 10 a.m. to 12 p.m. on 7/24 at Maypop Restaurant. We’ll have some experts on hand with the skills to help you help yourself and your coworkers make a better mental health environment. Fine humans of the NYC area, I’ve been working on this with some folks and it would be an honor to have you join us on 5/15. We’ll have some experts on hand with the skills to help you help yourself and your coworkers make a better mental health environment. Depression, anxiety, addiction, eating disorders and more. They run rampant in the food community, and they’re so rarely discussed, let alone treated. Let’s talk about it. This is a bit of an experiment after the message boards on chefswithissues.com got spammed and hacked. Great conversations were happening, but it was impossible to moderate. So I’m giving this a shot and trust that people are here because they want to talk openly and honestly, seek help, and help others. Talk amongst yourselves in the Facebook group, restaurant folks. It’s a closed group and I’m going to try my best to only admit people from the industry. What happens here stays here. If you’re a journalist sticking your head in, hi there. I respectfully ask that you refrain from reporting on any conversations you see happening. UPDATE: For folks who have asked, yes, Chefs With Issues is still very active and ongoing. Most of the work is done person to person, or via this very lively Facebook group. Read: I’m a Chef Who Walked Away From a Dream Restaurant. Here’s Why.